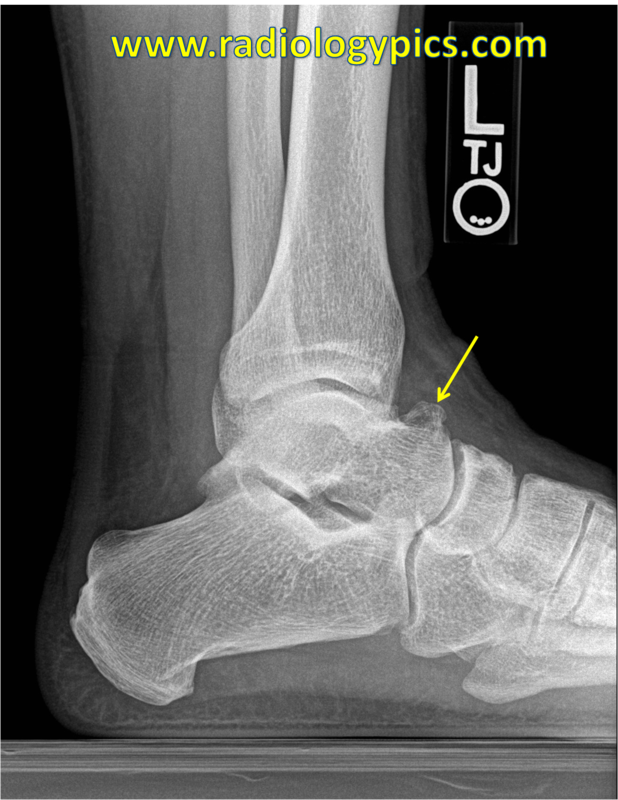 Dorsal talar osteophyte – Lateral radiograph of the ankle reveals a bony excrescence from the dorsum of the talus compatible with an osteophyte. Note there is no evidence of talar beaking or coalition. This is an example of a dorsal talar osteophyte, which is a mimicker of a dorsal talar beak. A dorsal talar osteophyte indicates osteoarthrosis of the talocrural or talonavicular joint. A dorsal talar beak is seen in cases of tarsal coalitions where there are abnormal articulations typically between the calcaneus and the navicular bone or the talus and calcaneus bone. A hypertrophied talar ridge can also mimic a talar beak. See an overview of tarsal coalition imaging here.